Aydin Energy Systems power transformer. Made for Gates transmitter. Possibly used but in excellent condition. Catalog #: 2B31. Harris P/N: 472-0669-000. Harris Spec: 815-0210-001. Prototype transformer. Hermetically sealed. 1/4" studs and terminals on bottom. Used, excellent condition. Kenyon Transformer Co. plate transformer. Used, clean. Alt. P/N: S-502122. Raytheon plate and filament transformer. Primary input 115V AC 60Hz 200mA. Hi-pot test 1,780V. Secondary output 4,200V @ 1 milliamp (single output terminal to ground), a 2.5V @ 2 amp (12,000V Hi-pot test), and a 6.3V @ 600 milliamp (4,600V Hi-pot test). Hermetically sealed. 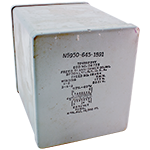 5"H x 6-3/4"L x 4-5/8"W.
Electran transformer. Hermetically sealed. 3/8" corner studs. NSN: 5950-00-645-1535. Chicago Transformer for Collins Radio. 3 phase, 9 kva. 230v primary, 3 phase, 50/60 Hz, 15 kv test. Used / removed. Dimensions: 11-1/2" x 23" x 17"
Los Alamos Lab surplus. Elma Engineering transformer. 3 phase, 220 volt input. 30 kv insulation. Soft rubber insulation on leads cracked at epoxy housing. Recommend placement of terminal posts on housing to remedy. 11-1/2" x 23" x 17". 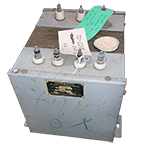 Magnetran plate transformer as removed from operating 20kw RCA transmitters running a pair of 4CX10,000D's. Each transformer has it's own cabinet (21" x 33" x 39"H). Very heavy! 3 phase primary 208v - 225v - 240v. Lots of life left. All checks out well. Shipping weight = 1,100 lbs. 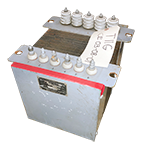 High reactance transformer. 2.18 kva, 60 Hz. Input: 11,200 volts, 135 Henries. Output peak: 22.8 kv. General Electric type Y-3502-A, catalog #8318065G-1. 11-1/4" x 21" x 25" high. Weighs around 500 lbs. Removed from new rotary spark gap. Brand new Scientific Radio Systems Power Supply for the SR-110 Kilowatt Amplifier. Supplies 1 amp continuous. 19" wide (rack mount), very heavy. Get a load of the huge BASLER hypersil transformer. Some parts like rectifiers, oil cap and bleeder resistor are not included. Sold separately or with RF decks. 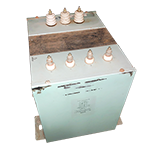 Multi-tapped power transformer matches any input from 105, 115, 125, 210, 230 & 250 vac. 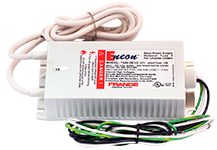 NOTE: This transformer is included in the SR-110 power supply (PS) AR-150A. Removed from Wilcox transmitters, more fine transformers waiting for a fresh assignment. 6" x 6-1/2" x 9" high (w/ insulators). Electronic Transformers Corp. plate transformer. Dual primaries. 50/60 Hz on primaries. New in wood crates. 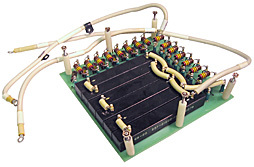 3 phase, high voltage rectifier board. Includes 6 ERTI rectifiers, 2 legs of 240k, 2 watt carbon composition resistors for series of 1.875G ohm each. This board is compatible with, and was removed from NEW, 10 GHz Magnetron transmitter power supply with (TP) 845309-2 High Voltage Transformer. Measures 7-1/2" square. Freed Plate Transformer. Primary: 117v @ 60 Hz. Secondary: 2850v c.t. @ 70mA. Hermetically sealed. 4" x 5" x 4-7/8"H. 3" x 3-3/4" mounting centers on 10-32 studs. France neon sign transformer. 7500v @ 300mA. Primary: 115v AC, 50/60 Hz. 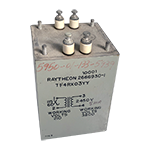 3" x 6-1/2" x 1-1/2"H.
Raytheon plate transformer. Hermetically sealed. Turret terminals. Primary: 115v @ 60 Hz. Secondary: 2450v @ 5mA. 3800wv. Continental Electronics plate transformer. 4.1 kva, 15 kv test. Continental Electronics plate transformer. 7500v test. Spare for Continental 420. Continental Electronics plate transformer. 15 kv test. Spare for Continental 420. Used.